August is traditionally the month when I give my laziness freer reign than usual. But I’ve been roused out of my air-conditioned indolence by the news that Lincoln Center is hosting a Sun Records tribute this Saturday, part of its weekend-long Roots Of American Music Festival. As soon as I heard this news, I grabbed the 160 to reacquaint myself with Sun’s catalog. To my horror, I found I had almost none of it loaded onto my iPod. There were a few early Elvis tracks, the odd Jerry Lee Lewis and some Johnny Cash, but little of the great blues and R&B recorded by label founder Sam Phillips at 706 Union Avenue in Memphis. I went down to the basement and started digging though boxes, looking for my copy of The Sun Records Collection, a 3-disc boxed set from 1994. 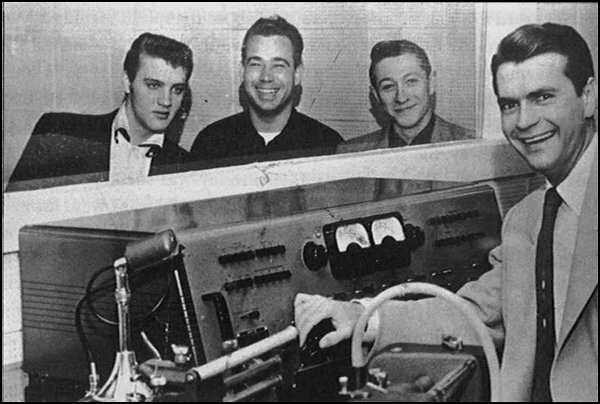 For nearly 60 years, Sam Phillips has been famous as the man who discovered Elvis. But it’s only fairly recently that critics and historians have started to celebrate the full scope of his achievements. Phillips didn't really “discover” Elvis: Elvis sought out Phillips. The producer had already released some of the future King's favorite blues and R&B records, songs like "Mystery Train" by Little Junior's Blue Flames. The Sun Records Collection includes such Sam Phillips-produced tracks as Ike Turner’s “Rocket 88” (sometimes described as the first recorded rock ‘n roll song), “B.B.’s Blues” by B.B. King, “Moanin’ at Midnight” and “How Many More Years” by Howlin’ Wolf, “Tiger Man” by Rufus Thomas and “Just Walking In The Rain” by The Prisonaires. Had he never met Elvis Presley, Sam Phillips could still have claimed a formidable place in the history of 20th century music. But of course he did meet and record Elvis, as well as Carl Perkins, Johnny Cash, Jerry Lee Lewis, Roy Orbison and Charlie Rich, among others. That’s a hell of a second act. Phillips let the production fit the music, not the other way around. If you only know the comparatively sparse sides he recorded with Elvis, Perkins, Cash and Lewis, you’ll be surprised by the sonic ferocity of “Moanin’ at Midnight,” with its overdriven guitars and the distortion produced by Howlin’ Wolf’s outsize voice. Willie Nix’s “Baker Shop Boogie” features a bass drum pulse that’s heavier than anything on the rockabilly sides, while the vocals on The Southern Jubilees’ “There’s A Man In Jerusalem” are devoid of echo completely. There’s also a goofy side to a lot of what Phillips recorded, a willingness to sound unprofessional, which helps account for the continuing freshness of the tracks. Though Elvis’ vocal quirks—the hiccups and the comic slurs—were copied with almost religious exactitude by later singers, they were in origin no more than a young man’s expression of youthful energy, and it’s to Phillips’ credit that he didn’t try to smooth out the singer’s style. That same tolerance of weirdness can be heard in Harmonica Frank Floyd’s Yosemite Sam lisp on “Swamp Root” or the screeching cat sounds with which Rufus Thompson opens “Bear Cat” (his answer to Big Mama Thornton’s “Hound Dog”). Compared to today’s pop productions, which are about as spontaneous as a State of the Union address, Phillips’ records seem like marvels of off-the-cuff inspiration. His entire career was built around an ear for, and appreciation of, sounds that most other people found strange. Maybe that’s his most important legacy.